Idaho Gov. C.L. 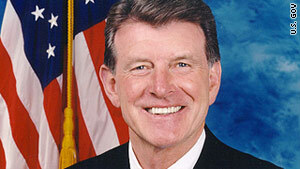 "Butch" Otter signed legislation, preventing the state from enacting parts of the federal heatlh overhaul bill. (CNN) -- How much power do individual states have to block implementation of the new health care reform law? A lot, if the governor of Idaho has his way. Gov. C.L. "Butch" Otter, a Republican, issued an executive order Wednesday prohibiting state agencies from implementing the controversial law, which is widely viewed as President Barack Obama's top domestic accomplishment. Otter's order states that "no executive branch department, agency, institution or employee of the state shall establish or amend any program or promulgate any rule to implement any provisions" of the law. Among other things, the order also bars state agencies from accepting federal funds tied to the implementation of the law. The move by Idaho's governor comes in the wake of a series of lawsuits filed by Republican officials against the law. Conservatives insist the law's various requirements -- including a mandate requiring individuals to have health insurance by 2014 -- are unconstitutional, and have used it to rally supporters in elections across the country. The text of Otter's order includes language calling the law "a dramatic attempt to assert federal command and control over this country's health care system." It asserts that the measure constitutes an "infringement on Idahoans and the authority of the state under the Tenth Amendment of the United States Constitution." The Tenth Amendment declares that "powers not delegated to the United States by the Constitution, nor prohibited by it to the States, are reserved to the states respectively, or to the people." Otter vetoed a bill passed by the GOP-dominated state legislature that, similar to his order, would block implementation of the law. The governor said he was concerned the bill would prevent Idaho from setting up a state-run health insurance exchange and inadvertently allow Washington to do so instead. "The legislature clearly wanted to send a message to the national government this session, expressing its frustration with Obamacare. I agree with the message," Otter said in a letter to Idaho's secretary of state. "However, it is equally unacceptable to forgo exploring viable state solutions to our health care needs and allowing the national government to assert more control over Idahoans," he added. Whether Otter's order could actually survive a legal challenge, however, is unclear. "Depending on how it's carried out, I think (the order) could well be unconstitutional," noted CNN senior legal analyst Jeffrey Toobin. "A state has no right to defy a federal law. ... If the governor is just grandstanding, that's meaningless. (But) if he is directing defiance, that's against the law." Toobin cited the Constitution's supremacy clause, which states that when federal and state law conflict, U.S. law come out on top. "No governor can unilaterally override federal legislation," said Joseph Antos, a senior scholar at the American Enterprise Institute, a conservative Washington think tank. But given the fact that most of the law's key requirements don't kick in until 2014, "it's too early to know whether this will have any impact at all." Trying to fight Otter's order in court "would be one of the dumber moves" the Obama administration could make, Antos argued. "It doesn't look good. It doesn't buy you votes." Americans remain sharply divided over the health care reform effort, according to must public opinion surveys. It remains extremely unpopular among conservatives. Against that backdrop, top Republicans have continued to seek avenues -- primarily in Congress and the courts -- to prevent implementation of the law from moving ahead. GOP House and Senate leaders are seeking to deny funds necessary to implement the law as part of any broad-reaching budget deal with the White House. At the same time, the law has been challenged in court by 26 states. The measure currently faces a June 8 hearing by the 11th U.S. Circuit Court of Appeals in Atlanta. The administration requested the hearing following a January ruling by a Florida federal judge declaring the law invalid. Judge Roger Vinson, based in Pensacola, concluded the so-called "individual mandate" -- the provision requiring most Americans to purchase health insurance or face financial penalties -- is unconstitutional. While Vinson did not issue a formal injunction to block either parts of or the entire law from going into effect, he concluded that since the minimum coverage provision is invalid, no part of the 2,700-page law could be enforced. In their successful request for the appellate hearing, administration lawyers argued that quick consideration by the court is crucial, given that the law is so comprehensive, affecting nearly all U.S. residents. The law has about 450 individual components, placing a number of new or revised regulations on states, private insurance companies, employers and individuals. In total, two federal judges -- Vinson and another in Virginia -- have found the law unconstitutional. Two others -- another in Virginia and one in Michigan -- have concluded the opposite.